Gold mining industry has made a lot of progress since the California Gold Rush era when people were using rudimentary precious metals panning methods. Modern day market is flooded with a variety of gold detectors for both professional explorers and individuals who view gold prospecting as a hobby. Knowing how any gold detector machine works will help you find a machine to match your prospecting needs. Generally, a detector is a handheld device that is positioned at about 1 inch over the ground and moved in slow motions over a small patch of ground; once natural gold nuggets are detected, it emits a sharp loud sound. There are two major technology types of gold detectors presented on the market today, VLF and PI. A Very Low Frequency (VLF) gold detector machine works according to the principle of metal conductivity. A very important detector mode called “discriminator” will enable your machine to “ignore” any other metals with poorer conductivity by 90% accuracy level. For example, with the “discriminator” mode on your detector will not pick up any metal bottle caps or fake gold coins since most of them are made of tungsten that possesses a different conductivity level than yellow precious metal. A VLF detector could be used virtually anywhere, in the parks, around your backyard or on a walk. This is perhaps and ideal device to use for a leisure type of explorer. A pulse induction (PI) detector, on the other hand, is a device that works in a dramatically different way compared to the VLF machine. A PI gold detector machine generates high current pulses that produce signals that must be analyzed after the device is turned off. PI detectors are especially good for detecting small metal deposits in highly mineralized ground conditions. PI machines also allow gold scrap recovery at deeper ground levels compared to VLF devices. Deciding on which gold detector to purchase depends on types of gold you are planning on detecting and actual ground conditions you are thinking of working around. A properly chosen gold detector will save you hours of digging work and help you find exact area to locate rare gold coins or any other precious metal pieces. 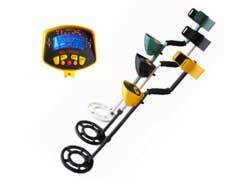 In addition to selection the right type of metal detecting machine, it’s important where you start prospecting. If you invest several hundreds of dollars in a nice piece of equipment, take the time to familiarize yourself with precious metals rich areas around the US and rules for prospecting.